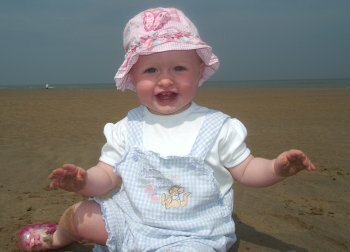 I had booked today off from work and we took our baby daughter (Amelia) for a day at the seaside. She is now 11 months old, and although we have taken her to the seaside before this is the first time she’s been able to play in the sand and paddle on the beach. As we were on the way we listened to Ant and Helen on Mercia FM. They were asking what people are doing to keep cool during the heatwave. I phoned through and told them about our last minute day off at the seaside. Unfortunately we’d reached the end of the reception area so I don’t know if they actually broadcasted it, but I suspect it was. After saying what I was phoning about I was put straight through to the presenters during the next news break. The previous time I was on the radio was during an interview for St. John Ambulance on Rugby FM last year. We went to Prestatyn first, parking at the Nova Centre Car Park (GPS: 53°20.5&apos;N 3&deg24.9&apos;W), which is practically touching the beach. The Nova Centre is looking a bit run down compared to when I last visited it as a child, but it is a nice sandy beach. Baby changing facilities were a bit poor (and only in the ladies), so we used a rug on the beach, and the back of the car to change her afterwards. Car parking was reasonable at £2.60 for a day. Amelia was a little apprehensive about the sand at first, but after a while she really took to it. We also took her for a paddle in the sea, although it was a bit too cold for her, despite it being another really hot day. I went for a swim in the sea and ended up swimming near to some seals. The first one looked like a black crash helmet at first, then as I swam a little closer it turned to look at me and I saw that was a seal. I saw two, although the life guard that had been watching me said that he had seen three around me. Apparently it’s fairly common to see seals there, although only one, or two. Normally the seals are found in larger numbers further down the coast. I didn’t have my compact digital camera with me. I went back for it. I kept it waterproof using an Aquapac soft case, which I also used when taking the photos on the beach as sand can do a lot of damage to cameras and is very hard to avoid when on the beach. Unfortunately the batteries had run flat by the time I got close enough to take any pictures of the seals. Although with the bobbing of the waves, I’m not sure I would have been able to get a decent photo with my compact camera anyway, I also kept accidentally changing the camera settings as it’s a bit difficult to control through the Aquapac (a number of my shots ended up black and white, or worse because I inadvertently knocked the settings dial). We had spent the morning at Prestatyn and then went into Rhyll for the afternoon. After parking on the road (free parking, although this was midweek before the schools break up, I suspect it’s much harder to get one of the free parking spaces normally), we had a fish and chip lunch on the sea front. Unfortunately it wasn’t in newspaper, but they were still very nice. We also gave Amelia an Ice-Cream to eat. So far she’s not been able to feed herself, even simple finger foods; whilst trying to get her to pose for the camera she discovered the ability to feed herself. It looks like she enjoyed it. We spent the rest of the afternoon going around Rhyll, before heading home. This entry was posted on Tuesday, July 4th, 2006 and is filed under Babies, General, Holiday, Tourism. You can follow any responses to this entry through the RSS 2.0 feed. Both comments and pings are currently closed.